Senior Isolation is one of the most commonly talked about and debilitating issues associated with aging. 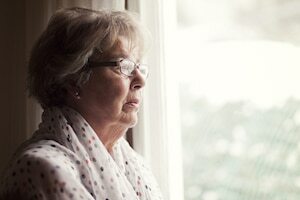 When living in isolation, seniors commonly deal with depression, lack of self-care, living in unsafe environments, slow emergency response, inadequate medical attention, and a lack of preventative care. These factors add up to a noticeable decrease in quality of life and overall longevity. But the good news is that these potential problems associated with isolation are avoidable. The cure: simply regular social interaction. Seniors that live in isolation can more easily fall into a cycle to improper self-care, due to depression and/or lack of physical ability. Everyday tasks like bathing and cleaning become more difficult as we age, and and especially when we age in isolation. Continuous lack of self-care tends to compound on itself, for example, a few missed showers can quickly lead to bed sores that limit mobility even further, making it more difficult to bath. A vicious cycle. Other issues associated with improper self-care can include major dental issues, more frequent illnesses due to improper germ control, losing important muscle stability due to inactivity and decreased mobility, and unsafe amounts of clutter and unclean living conditions. 2.8 million seniors are treated for falls every year, that equals a fall roughly every 11 seconds. One of the leading contributors to fall-related injuries is an improperly maintained, or overly cluttered living space. Carpets that are bunched-up on the edge, containers that aren’t in their usual spots, random articles of clothing, anything that is cluttering up the space can pose a major danger to seniors. When seniors live in isolated conditions, it is more common that they allow clutter to accumulate, and without attention this clutter becomes hazardous and will drastically increase the chances of a fall. Unsafe living conditions can be remedied by regular visits from a professional caregiver. While regular housekeepers do help keep the home tidy, they rarely understand how to best arrange living conditions for senior safety AND overall cleanliness. Professional caregivers have received proper training and can most reliably maintain a safe living space for aging adults. In the event of a fall, or a medical emergency, medical response time is typically much slower for isolated seniors. If there is nobody around to actually call in the emergency, or if the isolated senior is unable to get to the phone during an emergency situation, naturally the emergency services won’t know to offer assistance. Tools like the Life Alert system, or a cell phone help in these situations, but aren’t a replacement for daily check-ins and social interaction to make sure everything is alright. Practicing proper preventative care is important at every age, but as we get older it becomes crucial. A cough that passes after a few nights of good rest at age 40 can easily develop into an upper respiratory infection, or worse, at age 75. It is easier to treat minor health issues in seniors when they are caught early. In addition, maintaining proper medication schedules, practicing smart and healthy nutrition habits, and exercising on a consistent basis are all major aspects of preventative care for seniors. It can be difficult to identify exactly what someone means when they say seniors should practice better preventative care, and it can be even harder to figure out ways that you can actually encourage your loved one to practice preventative care, especially if they live on their own. Setting up regular visits from an in-home care professional is an increasingly popular solution. Whether it’s a visit twice monthly, or twice weekly; a trained professional can ensure that your loved one is handling their preventative care the right way. A staggering number of seniors suffer from depression. It can compromise their immune systems, make daily tasks feel like insurmountable obstacles (leading to lack of self-care), and it can have a substantial negative effect on longevity. While depression isn't an issue exclusive to seniors, it becomes more of an issue in the aging community due to isolation and loneliness. People are social by nature, and isolation typically serves to worsen depression, or create it where it never existed in the first place. It can be difficult to figure out exactly how we can help loved ones do things like maintain good hygiene or light exercise. To put it simply, just show up! Spend time with your loved ones, get them out of the house and mobile as often as possible, help them engage their minds. Being socially active naturally combats depression, promotes personal cleanliness, and helps keep a healthy mind. Nothing is more important to mental health than consistent interaction with loved ones. However, the reality is that regularly visiting senior loved ones is challenging. Maybe you live in a different state, or live across town, or maybe you have such a full plate that visiting more than occasionally is difficult. Luckily, it’s 2019 and factors like time and distance aren’t near as limiting as they were in the past. While physically being present to interact with loved ones is always better, video chats are only a button press away. Checking in nightly, or a few times per week, is an excellent way to stave off isolation and depression, and you can remind your loved one to practice healthy preventative care and self-care while you’re at it. If you or a loved one are worried about isolation, consider Companion Care services to help with companionship, and light housekeeping tasks. We refer qualified and compassionate care providers who can help with many different services to help prepare your loved one age at home. For more information about our services and coverage area, contact us to speak with a Client Care Liaison. More than 3 million people in the United States currently suffer from Glaucoma. By 2030, this number could increase to 4.2 million people, as more Americans age. Glaucoma often occurs without warning and can be nearly impossible to discover without receiving a proper diagnosis by a medical professional. It has been called “the sneak thief of sight” because of how difficult it can be to self-diagnose. 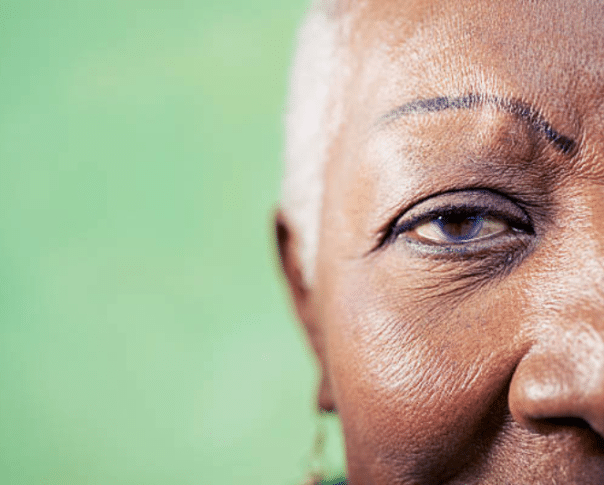 Glaucoma is the leading cause of irreversible blindness in Americans, specifically African American and Hispanic seniors, in fact it is 6-8 times more prevalent in African Americans than Caucasians. Doctors estimate that more than half of those with Glaucoma are completely unaware that they are affected, even though they are experiencing the slow degradation of sight associated with the disease. The difficulty to diagnose Glaucoma coupled with the boom in the number of people in the aging population could potentially lead to a huge increase in the number of Glaucoma cases, increasing the need for awareness and proactivity. Glaucoma is a group of diseases that specifically damage the eye's optic nerve, and can often lead to partial or total vision loss. The most common form of Glaucoma is open-angle Glaucoma, which is characterized by a slow increase in eye pressure. While there is no cure for Glaucoma once it has progressed too far, being diagnosed early opens up a series of treatments that can preserve vision health. Glaucoma typically sets in on peripheral vision first. If you start to notice that things on the edge of vision become more blurry or dark than objects directly in front of you, then you might be at risk for vision loss and should immediately consult your doctor. Vision loss in your peripherals will eventually lead to issues with your central vision, which is required for direct focus on objects and daily actions like reading or driving. Speaking to friends and family about Glaucoma. If you do fear that you may be suffering from Glaucoma, or if you have already been diagnosed, let others know to get checked out and not to be ashamed. Visit Glaucoma.org for free educational materials. Get involved with your community through fundraisers, research, and information sessions. It can be difficult to openly confront something like Glaucoma since it is a slow progressing disease. People can easily fall victim to a “wait and see” mentality, or assign the symptoms to simple loss of vision related to age. Awareness is important because it greatly reduces an individual’s chances of disregarding the signs. Aging or being genetically predisposed to Glaucoma does not necessarily mean you can't take actions to prevent issues from arising. Through extensive research, it has been discovered that there are some ways to minimize, or even completely avoid Glaucoma. If you are in any of the previously mentioned high-risk groups (Latinos, African Americans, Seniors, or those diagnosed with Diabetes), you should receive a comprehensive eye exam annually to catch Glaucoma early. If your eye care specialist discovers any signs of Glaucoma, they can prescribe eye drops that are capable of preventing any progression. Annual eye exams are covered by Medicare for individuals in high-risk groups. Speak to your family members about their overall vision health. Glaucoma is hereditary, so if any of your family members have vision issues, you may be at risk as well. Being more proactive about your vision health is easier with more knowledge. Like nearly every other health issue, overall physical health will reduce your risk factors. Maintaining a healthy weight, controlling your blood pressure, being generally physically active, and avoiding smoking will prevent Glaucoma in nearly every case. Diabetes, a major risk factor, can also be prevented by living a healthy lifestyle. If you have already been diagnosed with Glaucoma, there are several ways to make day to day life much more comfortable. Loss of peripheral vision can make it extremely difficult to see daily obstacles that would normally be considered simple. Have loved ones or a home care professionals mark stairs, treads, and handrails to make them easy to identify. Use brightly colored tape or paint to make important navigational tools clearer. Head injury is one of the more common issues that can arise from living with poor vision - be sure that doors and cabinets are always in the same position; either fully opened or closed. Creating predictable walking paths through the home is important. Low light situations are particularly difficult to those suffering from vision loss. Eyes adjust much more slowly when vision is already blurry and in a relatively constant low field of view state. Additional lighting should be installed in any living areas. The additional brightness considerably improves vision clarity and prevent accidents. Remove as many obstacles as possible from the home. Things like area rugs, and low height furniture like coffee tables and nightstands can be extremely difficult to see without peripheral vision. It is best to keep any pathways in the home completely free of clutter or extra furniture to make navigating as predictable as possible. If you or a loved one would like help making your home as low vision safe as possible, or if you are interested in a consultation to see which in-home care services would be right for your loved one, we can help. We refer qualified and compassionate care providers who can help with many different services to help prepare your loved one for the future and keep them home. For more information about our services and coverage area, contact us to speak with a Client Care Liaison. Family communication used to look very different before technology made it easier to keep in touch. It used to be that a letter around the holidays and a few check-ins through the year would be a perfectly normal amount of communication between a family and their elderly loved ones. When phones became more mainstream, calls from grandma and grandpa became a cherished part of every holiday celebration, and checking in with mom became a more regular occurrence. However, with the advent of modern technology, communication has become even easier and far more personal than a call during the holidays. Most major tech companies, including Apple, Facebook and Google, all have their own video chat devices that make connecting with family easier than ever. With the press of a button, you can quickly evaporate any concept of distance and be looking eye to eye with your loved ones. Seeing a grandchild’s first steps live on a video feed is one of the most incredible feelings in the world. Interested in Senior Care Services in Jacksonville, FL? Click here to see our locations and service areas. Video technology is not only a fun and personal way to check in with loved ones, it is also bringing a new dynamic to home health care. Video technology makes it possible to regularly monitor your loved ones and their physical and emotional state, and get up-to-date reports from their in-home caregiver at any time right over video chat without missing a beat. The best part of all is that home video devices are incredibly affordable. Major brands like Google have devices ranging from $40 to $200 for their top-of-the-line technology. Prices look the same all over the industry, and have only trended down in recent years. Companies are so motivated to introduce this technology that holiday sales often reach up to 80% off, so the holidays are a great time to get started in setting up a smart home for your loved ones. 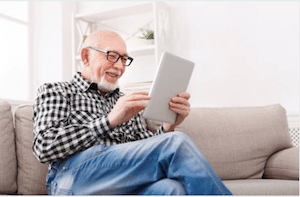 Technology can be a little bit difficult to grasp for seniors, but video chat couldn’t be simpler. All they have to do is press the button to dial and select an image, and the call is connected. Receiving calls looks nearly identical to receiving a call on a cell phone, so as long as they know the basics of handling a cell phone, they already know everything that needs to be known to use a home video chat device. If you or a loved one would like help figuring out communications, or you are interested in a consultation to see which in-home care services would be right for your loved one, we can help. We refer qualified and compassionate care providers who can help with many different services to help prepare your loved one for the future and keep them home, including Senior Care Services in Jacksonville, FL. For more information about our services and coverage area, contact us to speak with a Client Care Liaison. Is it time to think about transitioning to a multigenerational household? With the increasing cost of living and housing, young adults are more likely to live under their parents’ roofs for longer, and seniors are more likely to move in with their kids, creating a home with many generations of the same family. The cost to rent or purchase a home is often extremely high, even unobtainable in some of the nation’s largest cities. In an effort to live well, multigenerational housing is on the rise, and as a result, housing design is beginning to cater to this trend. Accommodations like half-plexes, dual master suites, and renovated homes with lofts are a few examples of the housing development changes taking place as the multigenerational housing trend is on the rise. Ensure that the home is practical for elder care with all the necessary renovations made before the adult parent moves in. Renovations could include wheelchair or walker access, rooms being accessible on the first floor, trip hazards removed, etc. Renovations for privacy are also very important, as modesty and privacy are key elements of dignity for seniors. For seniors who need help with showering or other personal-care issues, hiring a caregiver can allow them to maintain their dignity and independence by separating the caregiver/child relationship in their most intimate needs. Perhaps the biggest factor in multigenerational living is the need for adequate space. On occasion, kids will have to give up or share a room to accommodate a grandparent. This might be a fine fix temporarily, but adults and children alike need separate living space, so if you plan to make multigenerational living a longterm solution, make sure each person has their own bedroom and adequate living space. If you are interested in looking into a caregiver, we offer home care services in Tampa. Family dynamics inevitably change, especially when a parent takes on a new role as a living-mate in their adult child’s home. It could be the first time that grandchildren have long-term guests in their home, and it is important to make them feel like they are part of the transition process. Similarly, seniors will have to adjust to sharing the head-of-household role, or relinquishing that title when entering their adult child’s home. Communication is the key to establishing a new, larger family dynamic at home. Another factor in children caring for an elder parent is how to split up responsibilities when the parent has increasing needs, including disabilities or health conditions. Some families prefer to split their parent’s time, moving them between their homes. While this might seem like a fair solution, it can be taxing or even unfair to the aging mother or father. Frequent moves can take a toll and lead to health setbacks, confusion or mental distress. Communicating with all parties involved, and making a decision of which home will be shared before making new living arrangements is highly recommended and can provide a more seamless transition into a new multigenerational housing situation. 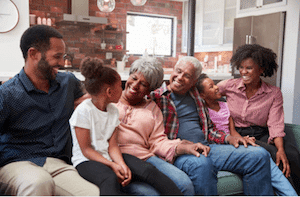 Multigenerational living offers a multitude of benefits to family members including affordability, additional care, and a strengthened bond between family members. Alternative ways for the non-hosting parties to assist would include financial assistance or taking turns with offering assistance throughout the week. American In-Home Care and our sister companies Advocate, Douglas, and Whitsyms always refer qualified, screened, and insured care providers for home care services in Tampa and surrounding areas that are compassionate and ready to help with services like transportation, assistance with activities of daily living, and companionship. Contact us at 1-844-505-0004 to schedule your free in-home consultation to discuss which care options are right for you and your family. Millions of veterans who need long-term care are missing out on the benefits they’ve earned simply because they don’t know about them. The United States Department of Veterans Affairs (VA) has a veterans Aid & Attendance pension benefit program pays for senior care, but the program has such a low profile that often even children of career military parents don’t always know it exists. Knowing about Aid & Attendance is the first step. As many as 25% of all U.S. seniors are veterans (and their surviving spouses) who might qualify for Aid & Attendance, but fewer than 500,000 veterans were actually receiving Aid & Attendance at the end of 2017. Are your parents missing out? Do you think you or someone you know might qualify for the Aid & Attendance program? The application process can be complicated, but we can help you navigate the application process. Contact us to speak with a Client Care Liaison directly. 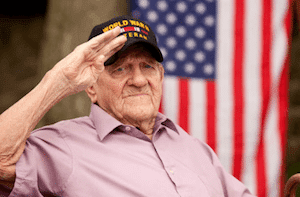 A qualified veteran or their surviving spouse who is 65 or older can get Aid & Attendance to help pay for long term care in a facility or at home. Recipients can also use their benefit to pay an adult child who’s acting as their caregiver, but not a caregiving spouse. It is important to note that the VA also pays retroactive benefits once approved. When the VA approves you or your parent’s application, they will send a lump sum that covers the time from the day you filed the application until the day it was approved. Then you or your parent parent receives their monthly payments going forward. We can help you learn more about the veterans Aid & Attendance benefit and to help you apply. Contact us directly and ask to speak to a Client Care Liaison about veterans benefits! This Veterans Day, take a few minutes to see if your parents may be eligible for Aid & Attendance and how you can help them claim a benefit they’ve earned. There comes a point with aging when it becomes increasingly difficult to complete normal and important daily tasks on our own. People with Alzheimer’s or dementia usually need support to manage their daily routines, activities, and tasks, but needing help to complete daily activities isn’t limited to seniors with cognitive impairment. It is very common that as we begin to age, we begin to develop a range of issues that might make it difficult for us to complete our activities of daily living, such as Carpal Tunnel Syndrome, broken bones, arthritis, general loss of muscle tone and balance, vision and hearing loss, and medication side effects, among many others. What are activities of daily living, and what can we do to make sure these daily tasks that serve as early warning signs don't get overlooked? Activities of Daily Living (ADLs) and Instrumental Activities of Daily Living (IADLs) are the technical terms for the vital daily tasks and activities that we need to complete on a daily or weekly basis to live a healthy and fulfilled life. A healthy and independent adult should be able to complete the full range of activities in both of these categories. Once limitations begin to appear, and ADLs or IADLs begin to be neglected, long-term care becomes a viable option for providing help to complete the tasks. Bathing: Maintaining good bathing and personal hygiene habits ensures that individuals feel relaxed, refreshed, healthy, and positive about their appearance. Bathing and personal hygiene are a vital part of a daily routine, and are the first activity that should be looked at when assessing if a loved one is capable of providing care for themselves. If their hygiene or bathing habits begin to be neglected, an in-home care providers can assist with getting in and out of the shower or tub, help with physically bathing, washing, cleaning, toweling, and preparing to leave the bathroom. Toileting: Being able to use the bathroom independently is obviously an important daily task, one that will show if an individual is capable of living independently. Bathrooms can be dangerous and difficult to navigate as we begin to age, so if your loved one begins to be nervous to go to the bathroom alone, has to go extremely frequently, or has difficulty physically getting on and off the toilet, an in-home caregiver might be the best choice to assist them. Continence: To maintain day-to-day normalcy and independence an individual should be able to control their bowels and bladder fully. This can often be an embarrassing and difficult subject to speak about, but it is important that it is addressed. The underlying causes of incontinence can sometimes be reversed if the discussion is broached honestly and early. Feeding Yourself: This is mostly an issue for those suffering from diseases like Alzheimer’s and Dementia, where seniors can have trouble remembering to eat at all. Severe issues can also cause severe shaking or degraded hand-eye coordination that self-feeding can become nearly impossible. In these cases, an in-home care professional can assist with feeding an individual in need of care. Even if an individual doesn't require hands-on feeding, an in-home caregiver can also be helpful for preparing healthy, nutritious, and regular meals. Dressing: Dressing isn’t limited to just getting clothes on, it also means dressing appropriately for day-to-day activities. Independent seniors should be able to differentiate between what should be worn for different weather patterns, as it could be dangerous to go outside under or over-dressed. Adults should be able to handle fasteners, buttons, etc on their clothes without assistance to consider this skill as a pass. Mobility: Functional senior mobility doesn’t necessarily mean running a marathon or going outside to shoot the basketball around. You should be able to get yourself out of bed in the morning and start your day without any major physical setbacks. Essentially, as long as you can move around your house without direct assistance, this skill is a pass overall. Meal Preparation: Even before physically cooking a meal, the knowledge of how it is done and recalling recipes come into play. For seniors suffering from early stage Alzheimer’s or Dementia, this hurdle alone may be too much to get over. Physically, you must be able to make measurements, handle hot stoves, reach into cabinets, and lift potentially heavy ingredient bags. You must also be mentally healthy enough to remember recipes and plan out nutritious and healthy meals for the day or week. What this skill boils down to is whether or not you can cook healthy food consistently enough to maintain a balanced diet. Housekeeping: Senior homes that are neglected for long periods of time quickly become extremely dangerous to live in. Eventually, simply walking around can become a serious hazard if you aren’t capable of simple housekeeping and cleanup. Hundreds of thousands of seniors are injured annually in falls, and illnesses that result from those falls can often be fatal. If you are unable to maintain a well-kept home, an in-home care professional to help with cleaning and maintaining the home is the best course of action. Transportation: Both mobility and challenges with short-term memory can make transportation a challenge for seniors. Being able to get around outside the home to buy groceries, go to the doctor, and visit family and friends are all extremely important factors in a senior’s continuing health, and they all depend on having access to safe transportation. In-home care professionals can assist you with traveling in your car, securing your trip, and making sure you get to your destination and back home safely. Why are ADLs and IADLs Relevant? Most doctors agree that if a person declines enough (either cognitively or physically) that they can no longer perform an ADL or IADL on their own, this should be taken seriously. It is very common that once one skill is failed the others will soon follow, unless the cause of the issue is addressed quickly. ADLs represent the first warnings of potentially serious issues, and should never be ignored. It is important to check in with your aging loved ones regularly to assess their condition. If you begin to notice any of the vital tasks (IADLs and ADLs) that are starting to be neglected, it is time to have a discussion about in-home care. Securing in-home care from a trusted provider is the best way to ensure that the quality of life or safety of your loved one does not decline in conjunction with the loss of these day-to-day skills. American In-Home Care and our sister companies Advocate, Douglas, and Whitsyms always refer qualified, screened, and insured care providers for home health care in Tampa and surrounding areas that are compassionate and ready to help assist with activities of daily living. Contact us at 1-844-505-0004 to schedule your free in-home consultation to discuss which care options are right for you and your family. It’s a tradition in October to unite together to bring awareness to the fight against breast cancer. According to the National Breast Cancer Foundation, breast cancer is the most commonly diagnosed cancer in women, as studies show that one out of eight women will be diagnosed in their lifetime. 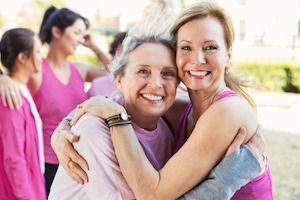 But did you know: 80% of all breast cancer occurs in women over the age of 50, and 60% of cases are found in women over the age of 65, making it a very senior-centric disease, and increasing the importance of staying proactive about your health as you age. It can also be more difficult for seniors to bounce back from cancer treatments, so it is incredibly important to practice preventative and proactive healthy habits rather than waiting until reactive medicine is necessary. Do you know someone that has breast cancer? American In-Home Care and our sister companies offer the best Home Health Care Tampa services that could help with recovery. When it comes to breast cancer, especially in aging women, early detection is extremely important because there is a greater chance to treat the cancer while it is in an early stage. The first step is to regularly self-examine your breasts so that you know what is normal, and can be aware of any unusual symptoms. Changes in how your breast feels or appears could be signs that something is off. The second step is being proactive if you do notice an abnormality. Do not hesitate to schedule an appointment to see your doctor for an exam or a screening if something feels off. Even if it ends up being nothing, it is better to get it checked out professionally as soon as you notice it. The biggest issue for senior patients with breast cancer is their unwillingness to come forward to speak to a doctor about potential issues. Doctors suspect that this unwillingness to proactively come forward and talk about abnormalities or issues stems from a generational conservative attitude about keeping health issues private, as well as many seniors assuming that issues could be side effects of other illnesses or medications that they have. A combination of awareness, early detection, and improved treatment options are doing wonders to spread hope and change across communities. The good news is since the dawn of the 21st century, there has been a significant decline in deaths caused by breast cancer. Studies are suggesting that these numbers will continue to decrease thanks to initiatives and awareness from people across the nation. However, it is important to remember that early detection is the biggest factor in lowering the mortality rate of breast cancer, and the number of aging patients that seek proactive medical care for breast cancer is far too low. So, be sure to encourage regular breast exams among the women that you love, and also reassure them that having a proactive relationship with their doctor can be life saving! American In-Home Care and our sister companies Advocate, Douglas, and Whitsyms always refer qualified, screened, and insured care providers for home health care in Tampa and surrounding areas that are compassionate and ready to help with services like transportation, assistance with activities of daily living, and companionship. Contact us at 1-844-505-0004 to schedule your free in-home consultation to discuss which care options are right for you and your family. Now more than ever, the idea of using alternative medicine and natural therapies is gaining more attention and appeal from doctors and patients alike. Both innovative and ancient holistic healing methods are becoming more popular thanks to their ability to reduce discomfort and pain, boost the immune system, strengthen muscles, and promote well-being. 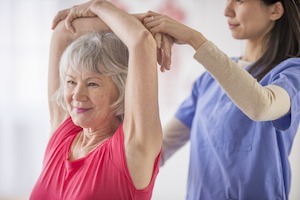 Whether you are entering the golden years of life, battling a sickness, or just ready to explore new ways to heal and restore, these three therapies are great ways to help keep a healthy balance within your mind and body. Many are aware that practicing yoga can decrease anxiety and depression, but how exactly? A recent study published by the Frontiers in Human Neuroscience has shown that yoga protects the brain from losing gray matter volume. This is important because gray matter volume is found mostly in the left side of the brain which is associated with feeling positive emotions and helping your body relax. MRI scans have shown that 50-year-olds who have practiced yoga and meditation were found to have the gray matter volume of 25-year-olds! What’s even more amazing, is that these changes in levels of gray matter volume within the brain can start to occur immediately after beginning. Remember, for those who feel that they are not flexible enough to do yoga, it is not about your ability to achieve the perfect pose. Yoga is your time to become more comfortable and accepting of who you are now. If you’re lucky enough to live near a beach, consider yoga in the sand since it is low impact and relaxing. But whether you are receiving companion care in Jacksonville or still weathering northern winters, yoga can work wonders. Click here for more information about the Companion Care Jacksonville seniors trust. It may be difficult to believe that placing hair-thin needles inside your body could be key to releasing hormones that relax your body immediately, but acupuncture has proven to do wonders for healing anxiety, nervousness, and even mood swings. Acupuncture is an ancient Chinese form of healing that uses hair-thin needles to stimulate different chakra points in the body. Once activated, the benefits include restored connection between the mind and body, released endorphins, and the ability to put your body at rest. If you are facing a more stressful time in life, or suffer from chronic pain, fatigue, or illness, acupuncture could be your ticket to finding relief and happiness. Laughter has the ability to lift people’s spirits and make us feel alive. Laughter has the ability to increase oxygen intake, relax muscles, release endorphins, and improve mental functions. After laughing for just a few minutes, you may feel better for hours. It is a contagious emotion that brings happiness, so it is now being recognized as a natural therapy to promote well-being and positivity within people’s lives. Recent studies have evaluated people before and after a humorous event occurs, the result showed that after laughing for a prolong period of time pain was reduced and the immune system was boosted. Doctor’s at Cancer Treatment Centers of America have begun to use laughter therapy as a physical exercise for groups who gather in a circle and make laughter sounds until they feel vibrations in their bodies. The result is contagious, so it makes it hard for people not to join in! Whenever you are feeling under the weather, you can always still laugh and feel better! If you or your loved one are interested in pursuing yoga, or various other therapies, we can help! American In-Home Care and our sister companies Advocate, Douglas, and Whitsyms always refer qualified, screened, and insured care providers for companion care in Jacksonville that are compassionate and ready to help with services like transportation, meal preparation, and socialization. Contact us at 1-844-505-0004 to schedule your free in-home consultation to discuss which care options are right for you and your family. Seniors are encouraged to do a range of things to help prevent Alzheimer’s disease as they transition into their golden years: switch to heart and brain healthy diets, start aspirin regimens, aggressively lower blood pressure, and maintain consistent mental stimulation. But what happens to those that end up developing Alzheimer’s disease as they age, regardless or preventative measures? New research and kinds of Alzheimer's Therapy are attempting to minimize symptoms and maximize comfort. The role of music in helping to treat and relieve symptoms associated with Alzheimer’s disease is one of the newer and more notable treatments to help seniors that are suffering. The incredible transformations of music therapy has been shown to completely turn around the quality of life of many seniors living with Alzheimer's. Does your loved one have Alzheimer's disease or dementia? Live-in care in Orlando is a care option to help minimize their symptoms and increase their comfort. Lighting Intervention acts in the same way as music therapy for individuals suffering from Alzheimer’s. The American Academy of Sleep Medicine undertook a multi-year study involving 43 seniors suffering from neurological diseases in several different living environments to discover the importance of lighting in relation to sleep, mood, and behavior. Individuals with Alzheimer’s typically suffer from sleep problems, aimless wandering, and general irritability that can present night or day. Utilizing specifically tailored daytime lighting patterns, researchers attempted to improve on these behavioral and sleep issues. What they found is incredible. While it’s not an instant “flip of the switch” like music therapy can sometimes be for Alzheimer’s patients, tailored lighting often led to equally staggering results. Compared to standard and inactive lightning conditions, seniors saw significantly decreased issues related to sleep disturbances, depression, and overall anxiety. The study involved a total of 43 seniors that had been positively diagnosed with Alzheimer’s disease and related dementias. Each individual was exposed to an active and inactive tailored lighting for 4-week periods, followed by a 4-week period. The tailored lighting program was added to locations in which the seniors spent most of their time when awake (i.e. the living room), and actively ran until 6 pm. Personal light meters monitored light exposures for each senior. Measures of sleep, mood, and agitation were taken weekly based on several indexes. The abstract from the tests and overall research results are publicly available in an online supplement of the journal Sleep. Presented at the Alzheimer's Association International Conference, the researchers saw substantial improvement in the patient's sleep, mood, and agitation levels. The largest improvements came in the form of improved sleep schedules. Put simply, controlling intensity and type of light being used in a care facility or at home can result in major improvement in three major measurables (sleep, mood, and agitation) related to Alzheimer’s. Changing light bulbs leads to a higher overall level of happiness, greatly improved sleeping habits, and significantly less irritability. In the future, this could lead to “prescription” lighting solutions. But in the here and now, it serves as an excellent reminder that light is a major synchronizer for our circadian rhythms. If you have a loved one suffering from Alzheimer’s it is important to ensure they are getting ample amounts of light during their waking hours. 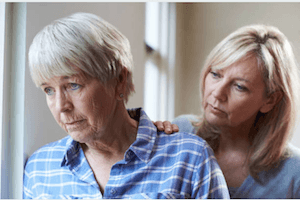 If you would like to explore lightning therapy as an option for your loved one, or if you are looking for a provider for live-in care in Orlando with experience caring for individuals with Alzheimer's, American In-Home Care can help. We refer qualified and compassionate care providers that are matched directly with your loved one's personality and needs. We can refer care providers that specialize in Alzheimer's and dementia care, and who have training and continuing education in this area to ensure they provide the highest quality of care to your loved one, and that you and your loved one are in the best hands. Senior Vaccinations: Protect Your Health! August is Immunization Awareness Month. Senior vaccinations and immunizations are incredibly important for maintaining health as we age, yet many seniors still go without these important shots every year. Influenza, or the flu, is responsible for 30,000 deaths and hundreds of thousands of hospitalizations in seniors annually. Pneumonia causes between 350,000 and 620,000 hospitalizations in the 65+ age bracket every single year, with most of the cases surfacing in fall and winter. 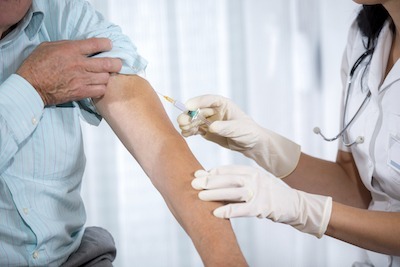 Alarmingly, 90% of all deaths associated with these two illnesses occur in the population of 65 and older, and many of these deaths could be prevented with proper vaccinations. After a hospitalization from a serious illness, many seniors required continued care at home. Learn more about our live-in care in Orlando and other Florida counties. Why Are Senior Vaccinations Important? Fall and winter weather brings stuffy noses, colds, and sickness every year. Between the months of September to February, seniors are far more likely to contract everything from the flu, to shingles, to meningitis and pneumonia. That’s why Immunization Awareness Month was created in August to serve as an annual reminder to get vaccinations in preparation for the coming fall and winter months. Seniors typically account for the majority of contracted preventable diseases. This is because they are the most at risk population for illnesses that that attack weak immune systems. However, CDC data shows that only 66% or two-thirds of seniors are actually immunized against the flu, and only 60% are immunized against pneumonia. This means that many of the deaths and hospitalizations related to these diseases could have been prevented with proper vaccinations. The importance of preventative medicine can’t be stressed enough in the senior population. Avoiding illnesses that are preventable can extend seniors' longevity and keep their health intact for longer. The CDC has released an easy-to-read list, split by impairments and age groups, to help seniors identify exactly which vaccines they should be getting this year. It can be accessed here, or referenced below in our quick cheat sheet for senior vaccinations. And schedule an appointment with your doctor to discuss your specific health circumstances. Influenza You should get the flu vaccine every year. Tdap You should get the Tdap vaccine renewed every 10 years, starting immediately. Shingles RSV You should get this initial shingles vaccine at age 50. Shingles ZVL This shingles vaccine should follow up your initial vaccine at age 60. Pneumonia It is incredibly important to receive both pneumonia vaccines once you are age 65+. Meningitis Meningitis vaccines are primarily based on your overall health, doctor consultation is needed. Chickenpox You should get this vaccine if you didn’t receive it as a child. If you were immunized as a child you can safely disregard it. Hepatitis B See Hepatitis A.
HPV You should get the HPV vaccine if you suffer from heart, lung, liver, spleen, or kidney issues. Measles The MMR vaccination is important if you suffer from heart, spleen, or kidney issues. If you or a loved one would like help preparing for vaccinations, or you are interested in a consultation to help set up appointments and doctors’ visits, we can help. We refer qualified and compassionate care providers who can help with many different services to help prepare your loved one for flu season, including live-in care in Orlando. For more information about our services and coverage area, contact us directly to speak with a local Client Care Liaison.